As talked about on the Whiplash Injury page, whiplash is associated with a stiff and painful neck due to the ligaments and tendons that support the bones and muscles in the neck being damaged from some type of accident that has caused a sudden motion to the neck. By damage to the ligaments and tendons we mean that they have been overstretched, which is also known as a sprain. Hyperextention – This is where the tendons and ligaments have been over extended beyond their designed capabilities. This is associated with usually the first stage of a whiplash injury as it is the jerking of the neck backwards. 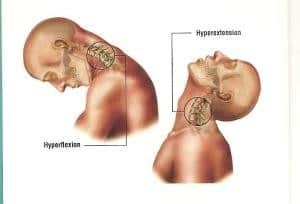 Hyperflexion – This is where the tendons and ligaments have been over flexed and is usually associated with the second part of a whiplash injury as it is the jerking of the neck forwards. The majority of the time the tendons and ligaments aren’t broken but sprained as most whiplash cases are mild in nature when compare to other serious injuries that can be sustained during a car accident. They can however take a long time to heal (can be up to several months) and do cause a serious amount of pain for a prolonged period of time depending on the severity of the injury. After an accident, the symptoms of whiplash can take a while to appear. They typically do not appear at the time of the accident, but usually develop over the course of the day, which means that the next day, symptoms such as a stiff neck and pain may become apparent. The symptoms and pain may continue to develop and get worse over time as any inflammation caused to the neck muscles isn’t evident at the time of the accident and also develops over time. Psychological and emotional “pains” such as anxiety and depression. Poor concentration, memory loss and irritability are also associated with chronic whiplash but are very rare symptoms. The first thing to do is to initially keep your neck and head as still as possible, just like you would a sprained ankle. You should consult your GP and describe your pain and the accident that occurred which may result in painkiller prescription. When you have administered your painkillers, you should try and make little movements with your neck initially and move up to some gentle exercises. This is to help speed up the recovery process and improve its functionality. Depending on the severity of the injury and if the symptoms last for several weeks, physiotherapy might be required. There are registered practices in the North West and around the UK that accept patients with whiplash injuries for treatment. The treatment consists of a range of physical techniques such as massage and manipulation to help with the restoration of function, movement and to help with the pain. Pillow Support – Using a specially designed pillow when you sleep to support your neck will help. Use the Spine Health Website for more information. Good Supportive Posture – Try and keep your back straight and upright whilst standing, walking or sitting to help support the spine and subsequently the neck. If your work consists of using a computer or sitting for long periods of time, try and adjust your seat for the optimum position to support your back and neck. Try the Alexander Technique for relaxation and posture control. Stretches and Exercises – For added extra help, try and do exercises and stretches such as yoga or pilates to help with the strengthening of the muscles and posture control. > Whiplash Injury – Information on the whiplash injury type and the compensation you could receive.